The world is heading on a collision course with the creator and it is evidence from the four winds of the earth. Evil has increased to a level never experienced in the earth, since its creation. A recent post of the spiritual experience of a man in the heavenly realm is worth considering in the assessment of happening world events! The man was given a message to the world, especially Christians, to depart from the worldly lust and embrace holiness and righteousness. He stated that recently, God Almighty was so angry with this present generation that he wanted to destroy it, but for the timely intervention of Jesus Christ. God’s anger stemmed from the fact that abomination that is upon the earth has overshot the projected levels and many Christians have abandoned the faith and followed after their pursuits. The Church that Satan was not supposed to prevail has become the meeting point of devils deceiving many with diverse signs, wonders and false biblical doctrines. The formally identified Christian nations of the world have compromised and allowed pollution from religious people to have the upper hand in their administration. The so called religious “correctness” – a devilish word used by the sons of the devil to compromise Christian standards and tolerance established by faith crusaders of the cross in this former great Nations. Slowly and surly Islam and other world religion are penetrating deep into once Christian strongholds. Daily in the Christian communities of the world, blood of millions of believers are being spilled and the world leaders are caring less. This innocent blood is crying for vengeance on a daily basis to the Throne of Justice in Heaven. The heavenly messenger stated that when Jesus Christ showed the Father his pierced hands and feet the blood gushing increased proportionately to God’s anger. This humbled the Most High and he repented of the destruction that would have taken place upon the earth. But he warned that if the situation in the world continued, he, the Most High would not be so merciful again. Brethren, the days of Noah were like the present day we are experiencing in the world today. Evil reached a crescendo that could not be tolerated from the heavenly host, only one family was found to be righteous and in tune to the rule of life. Noah became the tree of a rebirth which God Almighty hoped will depart from the wicked ways of the past. Jesus Christ became the spiritual and physical refinement of the rebirth of Noah’s lineage. Truly those who are in Christ are a new creation, old thing are pass away and all things have become new. Jesus is the way, the truth and the light – speak about him to others. The world want to erase the name of Jesus Christ and stop open preaching of the Jesus gospel, resist it by joining us in the TALKING T-SHIRTS campaign under SaYit! 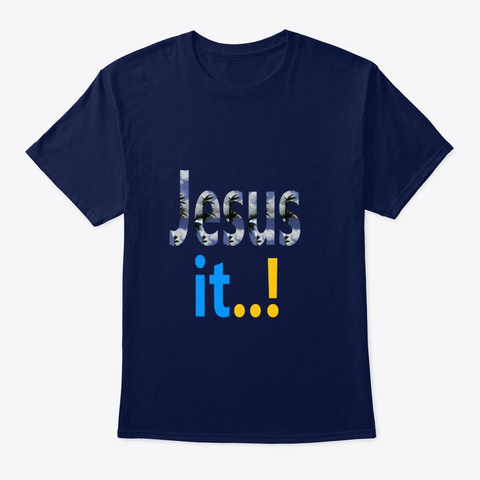 Let your T-Shirt say the name of Jesus this season, click on the link to buy your Talking T-Shirt.